Super Tuesdays are the best. This is the day when campers get to pick from a variety of special classes in which to spend an afternoon exploring one particular area of interest. It might be riding the zip line over Cass Pond, completing a Nature Nook challenge, or building a model rocket. Or maybe it’s playing Four Square In The Air, sailing around Cass pond, or going on an epic D&D quest with Doug Smith. As a volunteer Cabin Dad, my time at Camp is extremely limited so I usually like to do something silly and fun – that I don’t get to do anywhere else – like teach a Wizard’s Bike Class (this is when we all dress up like wizards and ride bikes while pretending to cast magic spells or chase monsters away from A-Field.) But, for this summer, I have an idea for an activity that I think will be the first of its kind: an archaeological dig to find remnants of one of the first permanent cabins built on the property. Using maps, documents, and photographs from our Lake Street Archives, we’ve been able to pinpoint exactly where it was. 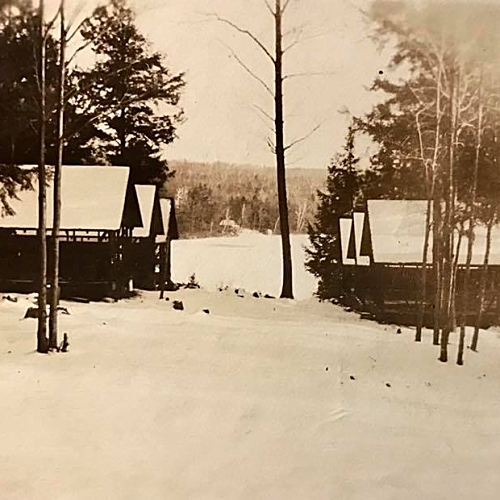 Located on what used to be called “Camp Street,” or what is now the upper portion of the Waterfront Road, the original six cabins were lined up, three on either side, facing each other. 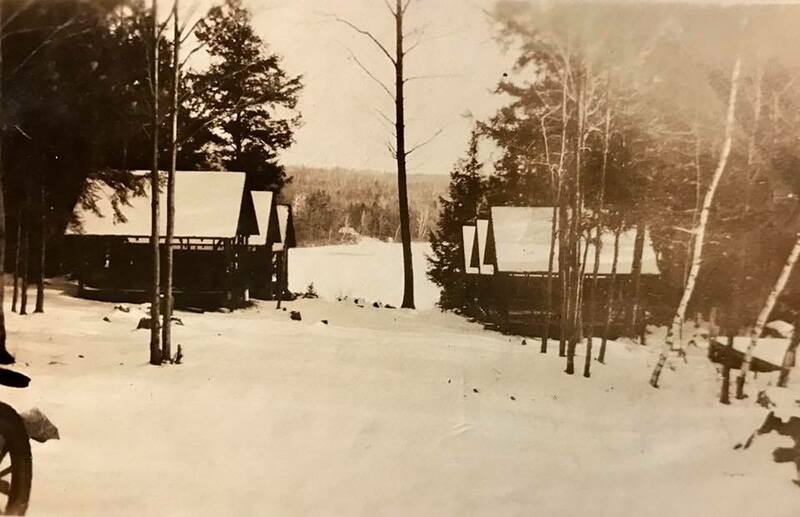 In some of the earliest photos we’ve ever found, you can see the first cabins in various states of use during the early 1920s. If you take a close look, directly in front of the cabin frame on the left, you can see a large, angled rock sticking up above the ground. That rock is still clearly visible on the property. In fact, you’ve probably walked by it a hundred – or a thousand – times and yet you never noticed it. My plan is to start sometime this spring with a metal detector. I suspect that there’s probably some nails or other bits that will give me a good indication that there’s something still waiting for us beneath the surface. If that proves to be true, during 1-Week Camp, we can use ground stakes and string to create a grid above ground, number each square, and then start documenting our dig. Whatever we find, we can put on display for everyone to see. 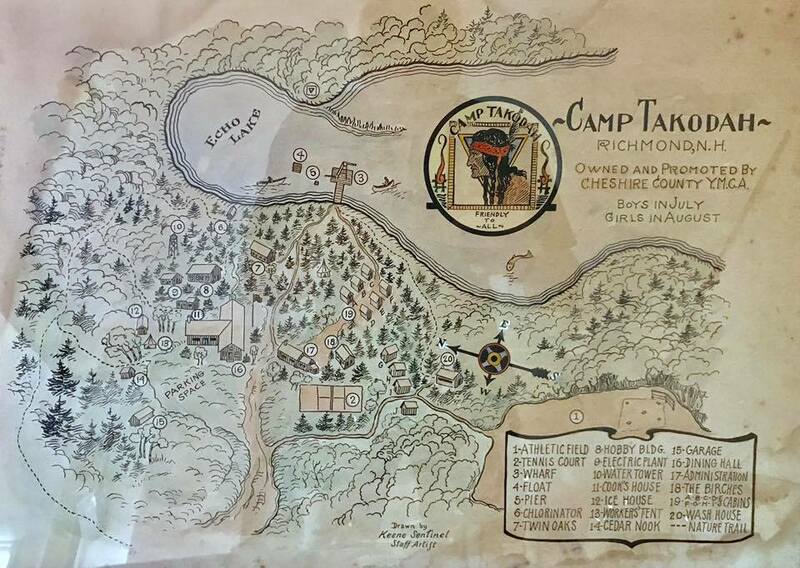 And if our search proves to be fruitless, we can still have some fun learning about our Camp’s history and having a chance to dig in the dirt and play in the footsteps of the boys and girls who first learned to “do a little good each day” around the woods and water of Camp Takodah. When we’re done, we can fill in the holes, remove the grid, and maybe even make a little sign in Hobby Nook so we can mark the spot where it all began. You see, my friends, there are hidden treasures and bits of history scattered all over Camp. Some are right before your eyes while others wait to be discovered. Nevertheless, each time we find something in the present, we directly connect ourselves to the past. So, for those campers coming to Session One, if you don’t mind getting dirty, I’ll bring the shovels if you bring the interest. I wonder what we’ll find. Let’s dig!